SI joint dysfunction refers to an abnormal function (e.g. hypo or hypermobility) at the joint, which places stresses on structures in or around it. Therefore sacroiliac joint dysfunction may contribute to lumbar, buttock, hamstring or groin pain. Sacroiliac Joint Dysfunction also known as- SIJ, sacroiliac joint pain, si joint inflammation, Sacroiliac Joint Disorder, Sacroiliitis, Sacroiliacitis, Sacroiliac Joint Sprain, etc. The sacroiliac joints are weight-bearing joints between the articular surfaces of the sacrum and ilium, which are located on the lateral surface of the sacrum. They are part synovial joint and part syndesmosis, with the synovial portion being the anterior and inferior one-third of the joint. There is hyaline cartilage on the sacral side and fibrocartilage on the iliac side. There are no muscles that directly control movement of the sacroiliac joints, but many indirectly affect movement. Sacroiliac joint movement is mainly passive in response to the action of surrounding muscles. The psoas and piriformis muscles pass anterior to the sacroiliac joints, and imbalance of these muscles in particular may affect sacroiliac joint function. Imbalance in the length and strength of the piriformis strongly influences movement of the sacrum. SI Joint Dysfunction occurs when there is an alteration of the structural or positional relationship between the sacrum upon a normally positioned ilium. The sacroiliac joint plays a small but significant role in the cause of low back and buttock pain, although the true incidence is unknown. It has been reported to occur in elite cross-country skiers, rowers, and gymnasts. It is a true synovial joint with extensive innervation from the lumbosacral region, accounting for the difficulty differentiating SI Joint Dysfunction from that of surrounding structures. Various medical conditions, such as rheumatologic disorders, infection, and neoplasms, may also affect the joint, and it extremely important for the sports physician to rule out the possibility of sacral stress fracture. Johnson et al. demonstrated sacral stress fractures in five collegiate athletes presenting with pain over the region of the sacroiliac joint . It is therefore prudent to perform further diagnostic workup in those subjects diagnosed with SI Joint Dysfunction who have a history of or risk factors for stress fracture or remain refractory to conservative care. The sacroiliac joint can be a significant source of low back pain. Etiologies of sacroiliac pain include spondyloarthropathy, crystal arthropathy, septic arthritis, trauma, pregnancy diathesis, and mechanical SI Joint Dysfunction. Sacroiliac joint dysfunction (pain from a biomechanical disorder without a demonstrable lesion) has been proposed as a possible etiology of sacroiliac pain. SIJ is a diarthrodial joint ( synonial anterior and fibrous posterior ). Its joint surfaces are reciprocally shaped but not congruent, have a high friction coefficient and have two large elevation allowing interdigitation with the reciprocal surface. Age changes begin to occur on the iliac side of the joint as early as the third decade. The joint surface irregularities increase with age and seem to be weight-bearing related. The capsule becomes more thickened and fibrous with age. The SIJ motion is best described as a combination of flexion and extension, superior and inferior glide, and anterior and posterior translation. SIJ motion is minimal, with approximately 2.5 degree of rotation and 0.7 mm translation, and it is best regarded as a stress relieving joint in conjuction with its counterpart and pubic symphysis. In the normal gait cycle, there are combined activities that occur conversely in the right and left innominate bones, and function in connection with the sacrum and spine. Throughout this cycle there is also rotatory motion at the pubic symphysis, which is essential to all normal motion through the joint. In static stance, when one bends forwards and the lumbar spine regionally extends, the sacrum regionally flexes, with the base moving forward and apex moving posterior. During this motion, both innominates go into motion of external rotation and out flaring. This combination of motion during forward flexion is referred to as Nutation of pelvis. The opposite occurs in extension and is called Counternutation. Vleeming and Colleagues have described their integrated model of joint dysfunction. It integrates structure (form and anatomy), function (force and motor control) and the mind (emotions and awareness). Integral to the biomechanics of SI joint stability is the concept of a self locking mechanism. The ability of the SI joint to self lock occurs through two types of closure: form and force. Form closure describes how specifically shaped, closely fitting contacts provide inherent stability independent of external load. Force closure describes how external compression forces add additional stability. The fascia and muscles within the region provide significant self bracing and self locking to the SI joint and its ligaments through their cross like anatomical configuration. This self bracing is formed ventrally by the external abdominal obliques, linea alba, internal abdominal obliques and transverse abdominals; dorsally the latissimus dorsi, thoracolumbar fascia, gluteus maximus and iliotibial tract contribute significantly. Vleeming et al. further proposed that the posterior layer of the thoracolumbar fascia acted to transfer load from the ipsilateral latissimus dorsi to the contralateral gluteus maximus. This load transfer is thought to be critical during rotation of the trunk, helping to stabilize the lower lumbar spine and pelvis. A connection has also been shown between the biceps femoris muscle and the sacrotuberous ligament allowing the hamstring to play an integral role in the intrinsic stability of the SI joint. The biceps femoris, which is frequently found to be shortened on the side of the SI joint dysfunction, may act to compensate to help stabilize the joint. Precipitating factors for the development of SI joint disorders may include muscle imbalance between the hip flexors and extensors or between the external and internal rotators of the hip, leg length imbalance and biomechanical abnormalities, such as excessive subtalar pronation. The patient with si joint inflammation classically describes low back pain below L5. The pain is usually restricted to one side but may occasionally be bilateral. The SI joint disorders commonly refer to the buttock, groin and posterolateral thigh. Occasionally, si joint pain refers to the scrotum or labia. Broadhurst describes a clinically useful description of pelvic/ SI joint dysfunction. Clinically the patient has deep seated buttock pain, difficulty in negotiating stairs and problems rolling over in bed, with a triad of signs- pain over the SI joint, tenderness over the sacrospinous and sacrotuberous ligaments, and pain reproduction over the pubic symphysis. The physical examination should begin with observation of the athlete both statically and dynamically. The patient should be evaluated in standing, supine and prone positions, and symmetry assessed in the heights of the iliac spines, anterior superior iliac spines, posterior superior iliac spines, ischial tuberosities, glutal folds and greater trochanters as well as symmetry of the sacral sulci, inferior lateral angles and pubic tubercles. Leg length discrepancy should be assessed. True leg length discrepancies will generally cause asymmetry and pain, whereas a functional leg length discrepancy is usually the result of SI joint and/or pelvic dysfunction. Dynamic observation may reveal a decrease in stride length with walking, leading to a limp, or a trendelenburg gait due to reflex inhibition of the gluteus medius. Muscle strength and flexibility should be assessed. Full assessment of the hips and lumbar spine should also be performed. The presence of trigger points in surrounding muscles, particularly gluteus medius, should be noted. Palpation over the SI joint may reveal local tenderness. Numerous clinical Provocative Tests have been described to assess SI joint function. Some of the more popular tests include ,standing and sited flexion test, the stork test and Patrick (Faber) test. There is no specific gold standard imaging test to diagnose SI joint dysfunction due to the location of the joint and overlying structures that make visualization difficult. By using fluoroscopically guided sacroiliac joint blocks to confirm cases of sacroiliac joint pain, several authors have shown that clinical medical history and pain provocation tests are not reliable in the diagnosis of sacroiliac joint pain . Physiotherapy for sacroiliac joint dysfunction- Patients often work with a physical therapist. After evaluating patient's condition, a therapist can assign positions and exercises to ease your symptoms. The therapist may design an exercise program to improve the strength and control of back and abdominal muscles. Some therapists are trained in manipulative techniques that attempt to treat the pain in this manner. Sacroiliac Joint Exercises- Due to the complex nature of the SI joint and its surrounding structures, treatment must focus on the entire abdomino-lumbo-sacro-pelvic-hip complex, addressing articular, muscular, neural and fascial restrictions, inhibitions and deficiencies. Core stability training should be included. A recent study has suggested that the clinical benefits incurred with training the transverse abdominis muscle may be due to significantly reduced laxity in the SI joint. Exercise rehabilitation is an integral part of recovery from SI joint dysfunction Pelvic or SI joint dysfunction should be considered with the lumbar spine in any program designed to improve the overall control of the lumbo pelvic area. Stretching and soft tissue therapy are useful in correcting pelvic/ SI joint imbalance. The most common soft tissue abnormality found with unilateral anterior tilt are tight psoas and rectus femoris muscles. 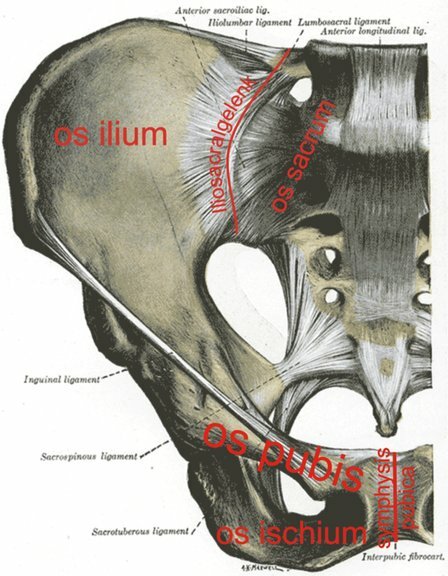 A technique to reduce psoas tightness is by soft tissue therapy- sustained longitudinal pressure is applied to the psoas muscle fibres superior to the inguinal ligament with the hip initially flexed and slowly moved into increased extension. Muscle energy technique may also be helpful, as may osteopathic manipulation. Manipulation of a dysfunctional sacro-iliac joint where the innominate bone is posteriorized using the Chicago technique, so called as it was developed by the Chicago School of Osteopathy USA. Sacroiliac belts Some patients benefit from wearing a special brace called a sacroiliac belt. This belt wraps around the hips to hold the sacroiliac joint tightly together, which may ease your pain. Taping is another method, the Tape provides support to the SI joint and alleviates pressure on the nerves in this region. Pain relief is felt immediately and continues to improve with use. If these manual techniques fail to control the sacroiliac pain, injection therapy may prove useful. A combination of local anesthetic and corticosteroid agents may be injected into the region of the SI joint, either with or without fluoroscopic guidance. Sclerosants, are occasionally used when hypermobility is present, sometimes referred to as prolotherapy.